SAP; stands for "Systems Applications and Products in Data Processing". It is a German Software and is being implemented in 2, 48,000 companies from SME's to Large MNC's, hence there is a boom for professionals who can work on any of the many openings that it provides. The job opportunities are in IMPLEMENTATION, CUSTOMISATION, SUPPORT, SCALING, MAINTENANCE, USER TRAINING, JOB UPGRADATION, Overseas Opportunities in all countries of the GLOBE. We request you to come down to our office for as per your convenience, so that we can give all information’s regarding SAP. We suggest the module on the basis of Educational Qualification and Industrial Experience of the candidate. 2)Elearning – Part time training flexible timings. ( Weekdays/ weekend ) . After completion of the Training, we provide 100% Job Assistance. The only SAP AUTHORISED TRAINING CENTRE AT COIMBATORE . Specialized only in SAP Training without any diversions. Direct Certification from SAP AG Germany. Flexible batch timings, so, your daily schedules don’t get disturbed. 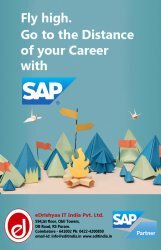 Study material Directly from SAP. Bank Loan facility available with easy emi.